Free schools have their roots in the anarchist Modern Schools of Spain in the late nineteenth and early twentieth centuries. Free schools are, at heart, non-institutional and non-authoritarian. Generally, they constitute a grassroots effort, a group of individuals acting collectively and autonomously to create educational opportunities and skill-sharing within their communities. Free schools often operate outside the market economy in favor of the gift economy. Nevertheless, the meaning of the "free" of free schools is not restricted to monetary cost, and can refer to an emphasis on free speech and open learning. A major characteristic of free schools is the absence of mandatory classes, grades, tests, and homework. Students and teachers democratically create the few rules that exist in the free schools. A variety of free schools and affiliated organizations are found throughout the world with interested learners of all ages. 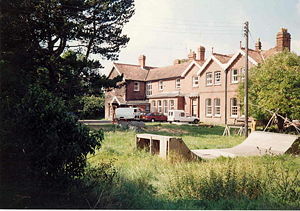 The most famous is Summerhill School, a boarding school in Suffolk, United Kingdom. While many such free schools continue, many others have closed. Free schools have their critics, who point out that success in education cannot be achieved only by resisting authority and rules, by negating wrongs; removing walls or restrictive standards. Doing so underestimates the extent to which evil has infiltrated the human heart—even in children, which rules are designed to constrain. Effective education sometimes requires positive intervention by skilled teachers who operate from a "parental" position, with the good of their students as their primary motivation. Critics also point out that by dismantling structures of authority, free schools do not teach young people the norms they will need for success in the real world, where rules and authority must be respected. Yet free schools are exemplary in their efforts to support the development of every student to achieve their full potential as human beings. A free school (or free skool) is a decentralized network in which skills, information, and knowledge are shared without hierarchy and the institutional environment of formal schooling. The more open structure of free schools is intended to encourage self-reliance, critical consciousness, personal development, and social responsibility. A democratic school is a school that centers on democratic principles and participatory democracy with "full and equal" participation from both students and staff. These learning environments position youth voice as the central actor in the educative process by engaging students in every facet of school operations, including learning, teaching, and leadership. Adult staff support students by offering passive and active facilitation according to students' interest. An open classroom is a student-centered classroom format that became popular in the United States in the 1970s. Since learning cannot be confined to the four walls of a school, the concept of an open classroom, originally meaning a classroom without four walls, has evolved into schools where emphasis on class trips, apprenticeships, and directed exploration allows students to experience learning in a variety of settings as well as achieving a sense of personal accomplishment. The Modern Schools, also called Ferrer Schools, were American schools formed in the early twentieth century around the ideas of educator and anarchist Francesc Ferrer i Guàrdia (also known as Francisco Ferrer) and modeled after his Escuela Moderna. They were an important part of the anarchist, free education, socialist, and labor movements in the U.S., intended to provide education to the working classes from a liberating, class-conscious perspective. The Modern Schools had classes for children during the day, and lectures were given to adults at night. A central tenet of the Sudbury Model of education is that each student should be free to develop his or her own curriculum. The model contradicts the idea that there is one set curriculum that everyone should learn in order to become a successful adult. Believing there are many ways for students to learn, and not judging individual choices of subject matter, students are free to design their course of study from day to day. This period 1890s was the heyday of libertarian schools and pedagogical projects in all areas of the country where Anarchists exercised some degree of influence. Perhaps the best-known effort in this field was Francisco Ferrer's Modern School (Escuela Moderna), a project which exercised a considerable influence on Catalan education and on experimental techniques of teaching generally." La Escuela Moderna (trans. The Modern School), was founded in 1901 in Barcelona, Spain, by Ferrer. The goal of the school was to "educate the working class in a rational, secular and non-coercive setting." However, only the wealthier middle class students were able to afford the high tuition fees. It was hoped that these students would be able to lead the working class when the time was ripe for revolutionary action. The school was closed in 1906 shortly before Ferrer was executed for sedition. La Escuela Moderna formed the inspiration for a series of Modern Schools in the United States and London. 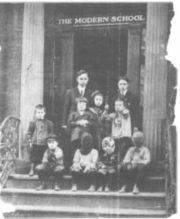 The Modern School in New York City, circa 1911-1912. Will Durant stands with his pupils. This image was used on the cover of the first Modern School magazine. The first and most notable of the Modern Schools was founded in New York City in 1911, based on the inspiration of Ferrer's ideas. Commonly called the Ferrer Center, it was started by a group of notable anarchists including Leonard Abbott, Alexander Berkman, Voltairine de Cleyre, and Emma Goldman. The school first met on St. Mark's Place in the Lower East Side, but moved twice to other locations in Manhattan, with the second move taking it out of the Village into Harlem. It opened with only nine students, one of whom was the son of the birth control activist, Margaret Sanger. Philosopher Will Durant was an instructor and principal of the school starting in 1912. Ashcan School painters Robert Henri and George Bellows were also among its instructors, and writers and activists including Sanger, Jack London, and Upton Sinclair gave lectures. Artist Man Ray also studied there. In 1915, a group of individuals who were loosely associated with the School's adult education program plotted to detonate a bomb at the mansion of tycoon John D. Rockefeller. A premature bomb explosion launched a series of raids and investigations into New York City labor and anarchist organizations, and the School's organizers decided that the city was an unsafe environment for their school. In New Jersey, 68 acres (275,000 m²) were purchased in Piscataway Township, and the school was moved there in 1914 as the center of the Stelton Colony. The Modern School magazine had started as a newsletter for parents of students when the school was still in New York, and was printed on the hand press used in the School to teach printing. 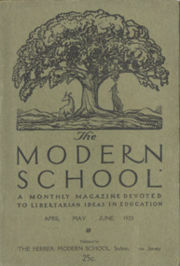 After the move to Stelton, the magazine was expanded to contain poetry, prose, art, and articles about libertarian education, with a cover emblem and many of its interior graphics were designed by illustrator Rockwell Kent. Many artists and writers, including Hart Crane and Wallace Stevens, praised The Modern School as "the most beautifully printed magazine in existence." Summerhill School is a progressive, co-educational, residential school, founded by A. S. Neill in 1921; in his own words, it is a 'free school' though this does not mean, alas, that it is state funded. The freedom Neill was referring to was the personal freedom of the children in his charge. Summerhill is first and foremost a place where children can discover who they are and where their interests lie in the safety of a self-governing, democratic community. There are two features of the school which people usually single out as being particularly unusual. The first is that all lessons are optional. Teachers and classes are available at timetabled times, but the children can decide whether to attend or not. This gives them the freedom to make choices about their own lives and means that those children attending lessons are motivated to learn. The second particularly unusual feature of the school is the school meeting, at which the school Laws are made or changed. These laws are the rules of the school, made by majority vote in the community meetings; pupils and staff alike having equal votes. At Summerhill, Neill stressed the respect for life and freedom without the use of force. He believed that children guided by these principles would develop the qualities of reason, love, integrity, and courage. Neill’s philosophy is to raise children to become happy human beings whose values are not necessarily how much you have but who you are on the inside. While the students of Summerhill School may not have become successful in the worldly sense, they have developed a sense of genuineness. A number of Free Schools, based to some degree on the Summerhill model, were founded around the world. Sands School, in England, is set just on the southern edge of Dartmoor. It was established in 1987. A small private school which receives no public funding, it is free to be different from government funded schools. It is democratic, with students and staff having an equal say in the running of the school. There is no headmaster, and all matters, from dealing with disagreements to the employment of staff, are decided in a weekly school meeting. An institution founded on similar principles as Summerhill School was Kilquhanity School in the Scottish Borders, founded by John Aitkenhead. This school closed during the 1990s. During the 1970s several other short-lived free schools were established in the British inner cities. Preshil school, established in Melbourne, Australia in the 1930s, is based on principles similar to that of Summerhill School, although it is non residential and classes are held at fixed times. It remains unaffiliated with any doctrinal or theological ideology, and has been popular among those seeking alternatives to the mainstream government and private schools. Students are involved in, and take responsibility for decisions about their curriculum, extra-curricular activities, and changes to the school environment. Since the 1970s, Preshil has operated up to grade 12. Melbourne Community School in Australia was established in 1977 by a parents group seeking an independent small school alternative. Formerly known as the Malvern Community School, it now is located in East St Kilda. Free schools have existed in the United States since the "Hippie Movement" of the 1970s. Many of the schools created at that time closed within their first ten years, but there are a few notable exceptions. Free schools in the U.S. have enjoyed increasing popularity in the early twenty-first century as people become more educated about school choice concepts and look for alternatives to the public school system. The large number of new schools based on the Sudbury Model are a good example of this increased demand. Grassroots Free School in Tallahassee, Florida, has enjoyed a long and successful history. In the 1970s, the school operated out of the club house of an abandoned, 40-acre golf club. Grassroots Free School was sculpted very closely from Summerhill School. The school was a favorite not only of hippies, but of liberal-thinking families that had grown tired of Southern paternalism. Also, the Natural Bridge School in Tallahassee held many of the same principles, and was a frequent high school extension of the Grassroots experience. The Albany Free School was established in Albany, New York in 1969, and unlike many similar U.S. schools of the time, still operates today. The Free School's founder, Mary Leue, corresponded with Summerhill founder, A.S. Neill, about her plan to take his experiment of radical freedoms to a different demographic, the inner city. She went on to create the Free School in Albany's urban south end with the idea of making these freedoms and democratic principles accessible to children of the poor. A central tenet of democratic schools is giving students the power to choose what to do with their time. There are no required classes, and sometimes there is no requirement to take classes at all. Students are free to choose an activity that they desire, or feel the need to do. They are free to continue activities for as long or short a time as they see fit. In this way they learn both self-discipline and self initiation. They also gain the advantage of the increases in both learning speed and learning retention that accompany engagement in an activity that one is passionate about. The students at these schools are responsible for and empowered to direct their own education from a very young age. Most of the free schools are also democratic schools. The oldest surviving democratic school, Summerhill School in England, was founded in 1921 by A.S. Neill. Kirkdale School was another A.S. Neill inspired "free" day school that existed between 1964 and the 1980s. Sands School, also in England and also a private school, was established in 1987. In the United States, well known successful examples include the Sudbury Valley School, The Circle School, and The Highland School. At least 100 schools around the world identify themselves as "democratic schools" today, in countries such as Australia, Brazil, Canada, Denmark, Finland, Israel, Japan, New Zealand, Russia, South Africa, The Netherlands, United Kingdom, and United States. Since 1993 there has been an International Democratic Education Conference (IDEC) which is held in a different country each year. The Sudbury model of democratic education is named after the school that pioneered it, the Sudbury Valley School. Since it was founded in 1968, this Framingham, Massachusetts school has been a source of inspiration for dozens of schools and institutions, and there are currently over 40 Sudbury schools around the world. Sudbury Valley School has published two studies of their alumni over the past forty years. They have learned, among other things, that about 80 percent of their students graduated from college, and that they have gone on to become successful in many areas of life. There have, as yet, been no formal studies of graduates of other Sudbury schools, but anecdotally, they seem to have similar results. Certain facets of the model separate it from other democratic schools and free schools, although there are evident similarities. One central defining aspect is the non-compulsory nature of the model and the equal, nonjudgmental treatment of all activities (within the bounds of school rules regarding behavior and conduct) which results in a great de-emphasis of classes and other activities normally emphasized for their educational value. This attitude stems from the basic belief of the educational model, that every individual learns what they need to know through life and that there is no need to try and design a curriculum that will prepare a young person for adult life. Another facet that often separates Sudbury model schools from other democratic schools is the limitation, or sometimes total absence, of parental involvement in the administration of Sudbury schools. Sudbury schools are run by a democratic School Meeting where the students and staff participate exclusively and equally. Lastly, Sudbury schools do not arbitrarily separate the students into age-groups, emphasizing free age-mixing as a powerful tool for learning and development in all ages. Sudbury schools generally accept children and teens, usually between ages 5–19. They do not segregate students by age, so that students of any age are free to interact with students in other age groups. Thus, for instance, School Meetings may be chaired by seven year olds, and classes will be organized by students' interests and abilities, rather than by age. One effect of this age mixing is that a great deal of the teaching in the school is done by students. Classes and other planned activities of the Sudbury Model are always voluntary and optional, and may be led by staff or students. Many students may choose never to take a class. Often, areas of the school are designated for a particular use, such as an art room, a music room, or a library. Although most areas would normally be free for any students to use, some items or activities may require a student to have completed a certification process to demonstrate their ability to use the item safely. Most of the schools have several certifications, such as to use a sewing machine or wood-working equipment. Although there is currently no official doctrine or association governing a Sudbury school, many schools have independently and voluntarily adopted the title of Sudbury school. The schools maintain good communication with each other, and recognize a loose camaraderie. Every Sudbury School is run by a weekly School Meeting sometimes in conjunction with an annual assembly. These meetings are modeled after the traditional New England Town Meeting. Most of the schools run this meeting using Robert's Rules of Order, with an elected chairperson presiding over the meeting and a secretary recording the minutes. All aspects of governing a Sudbury School are ultimately determined by the School Meeting. The weekly agenda may range from changes to the school's rules, to spending money within the budget, to hiring and firing staff persons. All present members receive an equal vote and most decisions are determined by a majority vote. Students and staff receive equal votes. Several aspects of running a Sudbury School are often delegated to other parties so that School Meetings do not become bogged down with the minutiae of detail. These may include elected administrative clerks (who may be chosen from staff or students), committees of volunteers, also corporations and cooperatives formed by the School Meeting for a specific area of activity that a group is interested in organizing, such as sports, art or computers. Most Sudbury schools have also developed a law book that outlines the school's policies. All such laws are subject to School Meeting review, and cover such matters as rules regarding safety, personal behavior, and school management. When a school member has broken a school rule, such as by harassing or hitting another member, or by mismanaging a delegated responsibility, most Sudbury schools have some form of a committee to handle these situations. This is commonly through a Judicial Committee, made up of drafted students and staff, or through a modified Judicial School Meeting of volunteers. Usually, there is a set procedure to handle complaints, and most of the schools follow guidelines that respect the idea of due process of law. There will usually be rules requiring an investigation, a hearing, a trial, a sentence, and allowing for an appeal. Beyond schools that offer democratic reforms to the educational system, radical experiments in non-hierarchical education with anarchist roots have given rise to temporal and permanent free schools. They are often termed "free skools" to distinguish them from what supporters view as an oppressive and institutional educational industry. Temporary free skools offering skill-shares and training have become a regular part of large radical gatherings and actions. More permanent skools in cities large and small have appeared across North America offering a wide range of workshops, classes, and skill-shares. These are on-going informal learning networks that focus on skill-sharing among adults as well as children. The boundaries between students, teachers, and organizers are consciously blurred, with some free skools claiming, "we are all teachers, and we are all students." Free skool "classes" are often autonomous workshops held in informal settings in homes, cafes, and community centers. Free skools typically offer a monthly- or quarterly-produced free skool calendar. Free skools can be found in many places across the United States and in Canada. More than just an opportunity to learn, we see Free Skool as a direct challenge to dominant institutions and hierarchical relationships. Part of creating a new world is resistance to the old one, to the relentless commodification of everything, including learning and the way we relate to each other." Today, classrooms that are physically open are rare, as many schools that were built when the idea of open education was translated by educational bureaucracy to mean "without walls" have long since put up partitions. However, in many places, the open philosophy as an instructional technique continues to thrive, though it is frequently not labeled as such. In schools where open education was not a top-down initiative, but a bottom-up phenomenon, they met with success. Piedmont Open/IB Middle School in Charlotte, North Carolina, for example, was started as one of the original two magnet middle schools in Charlotte in the 1970s. While the other magnet (a "traditional" school) has closed, Piedmont is still functioning as a modified open school 30 years later, all the time housed in a traditional physical building. Open schools must keep an informed parent and student body and especially a committed faculty. If one places a traditional teacher into an open environment, success is elusive. The lack of structure, physical (walls) or pedagogical (choice), can readily be blamed. Conversely, a committed open teacher with a supportive administration can create an open classroom in any school setting. Teachers who today require student input in the process of deciding how to master a given topic are indeed running open classrooms, whether or not they use the "open" label. The reason free schools abolished authority was to create not only a new environment in schools, but also a new society based on the voluntary heart and cooperation of free individuals. They understood that education comes from a true desire to learn and a genuine curiosity to pursue knowledge through a variety of ways as well as book learning. If students are genuinely inspired to learn, and they find the resources to implement that desire, progress can happen sometimes at an astonishing rate. However, if the environment created in a school is not enriching, the power to be self motivated will not be discovered. Given the fact that many free, open, modern, and democratic schools have closed, while other schools of the same principles have remained open, it is evident that schools need to reflect the diversities of the children as well as incorporating the approaches that work best in each situation. The staff must be compassionate and knowledgeable adults with strength of character and a desire to help others. Free schools operate on the belief that true and genuine happiness is an essential part of a healthy life. Just filling students with information or producing effective workers is not the underlying purpose of free schools. The deeper principle behind free schooling is for individuals to find their happiness, develop their skills, and create their own definitions of success. ↑ History of Modern School of Stelton Modern School of Stelton: History. Retrieved February 7, 2007. ↑ Introduction of Summerhill School A.S.Neill's Summerhill School. Retrieved February 8, 2007. ↑ International Democratic Educational Conference 2006 IDEC. Retrieved January 5, 2007. ↑ The Pursuit of Happiness: The Lives of Sudbury Valley Alumni Sadbury School-Online Library. Retrieved February 8, 2007. ↑ Other Free Schools Free Skool Santa Cruz: content/other free skools. Retrieved February 9, 2007. ↑ Free Skool Santa Cruz Free School Santa Cruz. Retrieved February 9, 2007. ↑ Piedmond Open/IB Middle School. Retrieved September 27, 2008. This page was last modified on 10 May 2017, at 16:28.